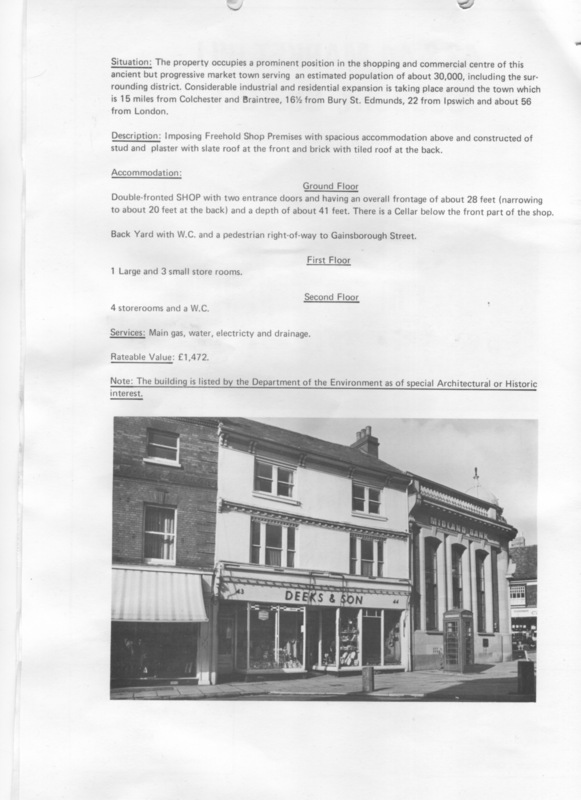 During the summer of 2017, the Sudbury Ephemera team spent all its sessions sorting through the Thornton’s Estate Agency property details – a previously featured acquisition which explained how some of the house details show the living space and facilities available to some of our ancestors who lived in Lion Walk and Inkerman Row. At the end of our last session for 2017 one of the team found the details for and two photographs of the Deeks and Son shop. This shop was next to the then Midland Bank and eventually became part of the now HSBC Bank. It was unfortunately one of the properties that was badly damaged during the fire of 2015. As many people ploughed through photographs of the town after that tragic fire, it became clear that although the fire damaged area was recognised as a special feature of the town, there were very few photographs of the buildings available. Numerous photographs exist of the Corn Exchange (library) and St Peter’s Church, but the bottom of Market Hill is mostly forgotten. The same is true of the north side of St Peter’s church where searches were made in earnest to try and find a photograph of the previous drinking trough, with no success. The photographs shows the telephone box, a solid cast iron one, designed to keep the caller safe. As of 2018 many telephone boxes have disappeared, as they are deemed no longer necessary because many people have mobile phones. Phone boxes (or more prosaically ‘telephone kiosks’) are a part of history that has changed from a 4d coin box that could easily be broken in to, to the STD 3d and time limited call, to the use of a prepaid card system, to becoming obsolete (see the Telephone Box for a detailed timeline). 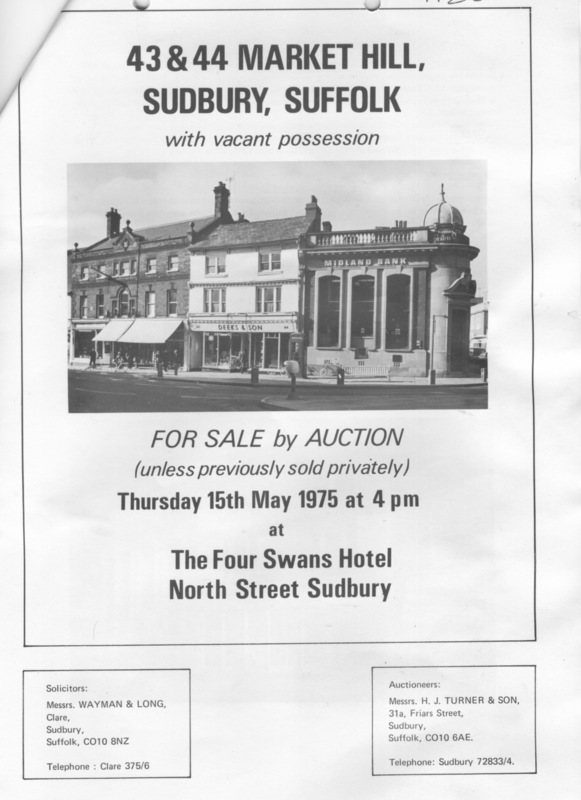 The property is advertised as being for sale by auction and of course the hotel where the auction would take place, the Four Swans, North Street was also destroyed by fire. 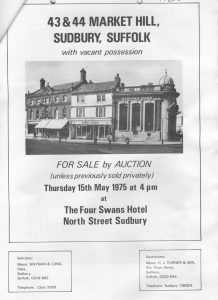 Before destroying any photographs of the town, please consider the possibility of donating them to the Sudbury Photographic Archive or Sudbury Ephemera Archive, as they may be able to preserve them for posterity.